A decade in business is a major achievement and one which Guangzhou’s K11 shopping mall have chosen to celebrate in style. This high-tech LED retail display features many elements to really make an impact. Colors: A concise color palette, of blue and pink tones looks great against the neutral white and black shades. This also has a wide appeal as the retail display has not been designed to appeal solely to either men or women. The fact that both male and female mannequins have been used reinforces this. 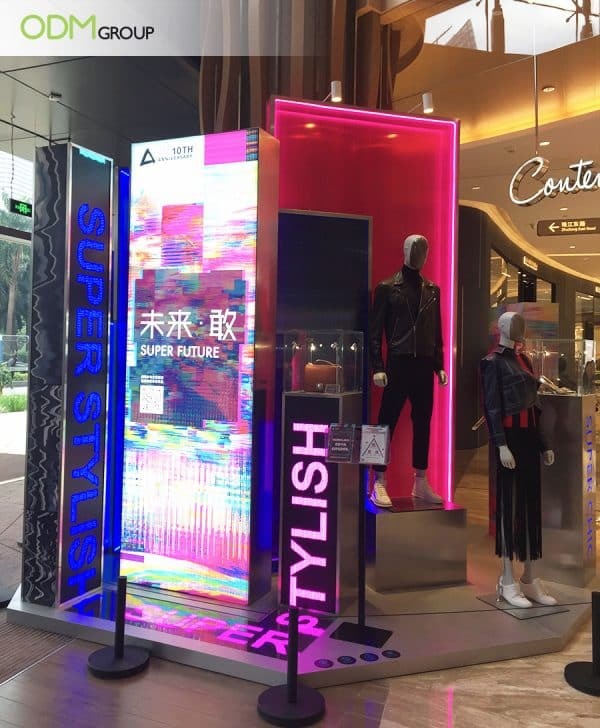 Branding: The display repeats the words “stylish” and “super future”. These terms highlight the mall’s fashionable offerings and, in celebrating their decade in business, looks ahead to the future. Materials: The neon pink LED strips stand out against the neutral base colors of this display. The metallic base reflects the bright lights and is sure to grab the attention of shoppers. High-quality: K11 is a high-end shopping destination so it makes sense that they would use premium materials in crafting this display. Sturdy plastic and metals are an on-brand choice for this LED retail display. Design: K11 have opted for a stylish “glitch pattern” in the design shown on the large screen. Blue and pink are also the main colors here. This ties the display together and results in a cohesive final look. Appropriate: Both mannequins have been styled in black leather outfits with white shoes. The design is not intended to promote a particular brand of clothes so this simple approach is clever. This places the focus on the mall itself instead of singular clothing items they may sell. Why opt for a high tech display? Unique: The single most eye-catching aspect of this display is the LED screens. These screens are more vivid and bright than a traditional printed poster. A marketing LED display grabs the attention of shoppers effectively. Reusable: It comes as no surprise that these screens are not cheap to source and customize for a display. However, these can be easily loaded with new graphics for other events. As such, K11 can reuse these screens – and the entire display itself – many times in the future. Simply changing the LED light color, mannequins and the graphics displayed will result in a fresh new display, requiring little effort. 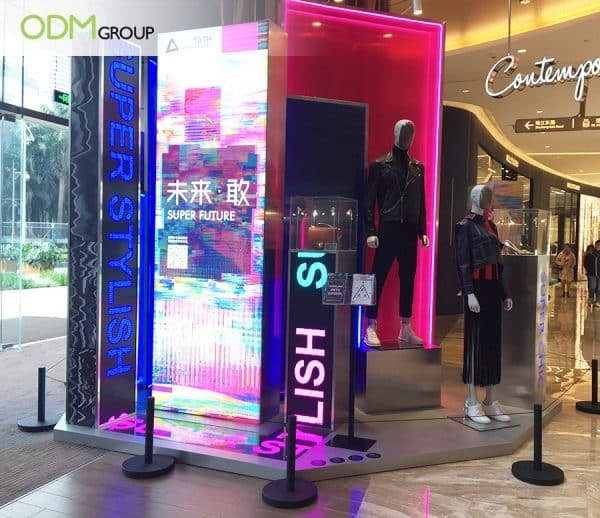 Cutting-edge: Due to the reasons listed above, I predict that LED screens will become an increasingly popular choice for merchandise displays in the near future. This is similar to the recent shift from print to digital advertising boards. In the long run, a modern retail display is more cost-effective than traditional alternatives. Moreover, it will stand out far more than the rest. K11 stock designer brands and cater to high-end clients. It makes sense that the shopping center would go above and beyond with their display units, cementing their brand’s reputation as a premium shopping destination. Are you searching for an LED retail display to give your business a modern edge? ODM are experts in developing and producing cutting-edge promotional displays, custom POS display, and marketing items. Reach out today to learn how we can help you! This display uses cardboard – making it a cheaper option – but still looks fantastic. This display features life-sized cutouts. Without a doubt, it will attract the attention of shoppers. This memorable display is fun and brand relevant, as it features Cadbury’s classic shade of purple. Ferrero’s large POS display was perfect for the holiday season. Premium brands should take care to produce a branded retail display which fits their image.